Frankincense & Myrrh is a dark, mystical fragrance with notes of frankincense, rose, violets, myrrh and amber. Available in 160g Jar with gift box. Jar candle burns up to 40 hours. Made with natural rapeseed and beeswax and the finest quality fragrance oil for a superior scent throw. My candles are handmade from start to finish to maintain excellent quality and a professional finish, making them the perfect gift or indulgence at home. Each jar measures 70mm diameter by 80mm tall and comes in a card gift box measuring 72mm by 85mm. The jars hold 190ml (160g) of wax and are made of glass with a gold metal lid. My shipping cost is set at a low fixed rate price meaning the more items purchased the more you save on postage. Dispatch 1-2 business days. Delivery up to 5 business days from dispatch – tracked courier. Before each lighting trim the wick to 5mm to achieve the ideal flame. 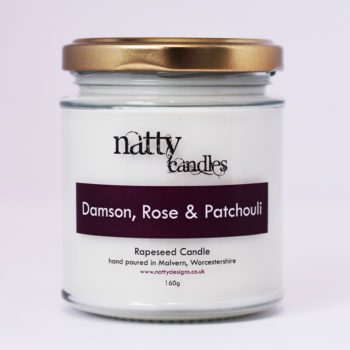 When first lighting your rapeseed candle make sure a melt pool forms to every side of the jar (which takes 3-4 hours). This is to avoid ‘tunneling’, to give better scent throw and to make your candle last as long as possible. 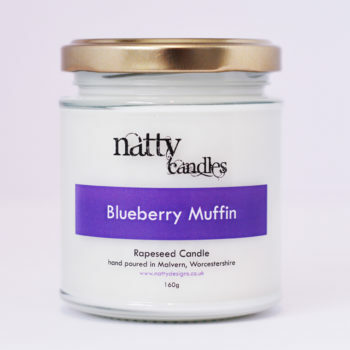 As with other natural waxes, rapeseed wax can sometimes have a frosted appearance; this does not affect the burn or scent throw. 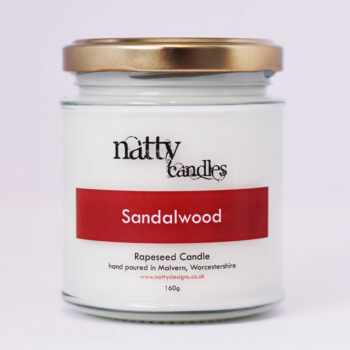 Rapeseed wax works brilliantly in container candles and gives an attractive ivory finish. It binds well with fragrance oils and releases scent evenly due to its lower melt point. 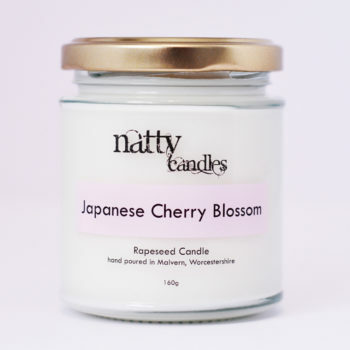 It is a completely natural wax so does not contain the chemicals paraffin releases and it is much more sustainable than paraffin and soy wax (being produced in the UK and EU and not from GM crops or fossil fuels). The rapeseed is mixed with British beeswax to create a more versatile wax, which makes it ideal for scented container candles. I have sourced my packaging and postage materials to be easily recyclable at home and from sustainable sources wherever possible. I will also reuse certain packing material received from suppliers to reduce wasteful use. This is a lovely sweet smelling candle. A great product and excellent service too. Superb!